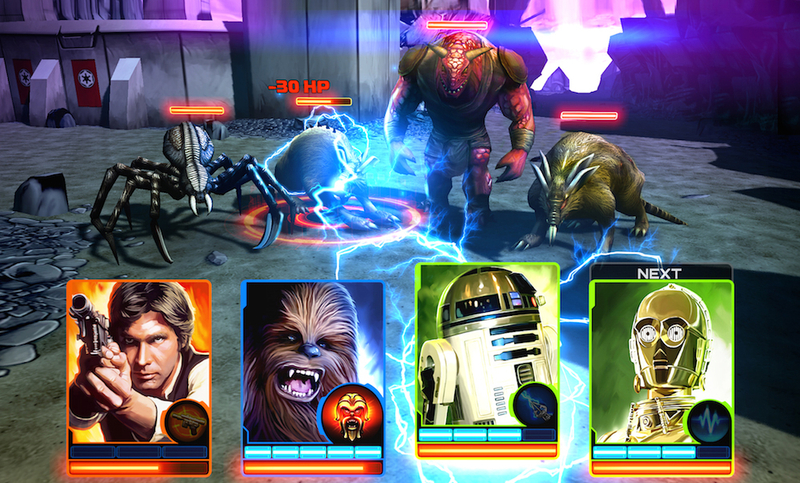 A new game called Star Wars: Assault Team launched on Google Play this morning, from Lucas Arts and Disney. The premise is that you must build an assault team comprised of your favorite Star Wars characters, then lead battles against the imperial forces. The gameplay reminds me of Pokemon, as it is a turn-based game. The overall look of the battles isn’t very compelling, but the story takes place between Episode IV and Episode V, which means you will be battling against characters you know (and love), and fighting on planets you have seen before in the movies. And don’t worry, there is no Jar-Jar. When a battle takes place, your characters rank up, becoming stronger, allowing you to battle more powerful foes. As you progress through the missions and the story, it appears that this is all leading up to a few boss battles, which includes a battle against Darth Vader. The title is free to download and play, but there are most definitely a few IAPs to help you progress through the game quicker. Star Wars fans, go get some.